We did our last agility trial for the year this Saturday. The arena is five hours away from where we live, but I don’t have many weekends to compete in the spring due to a lot of travelling and working. 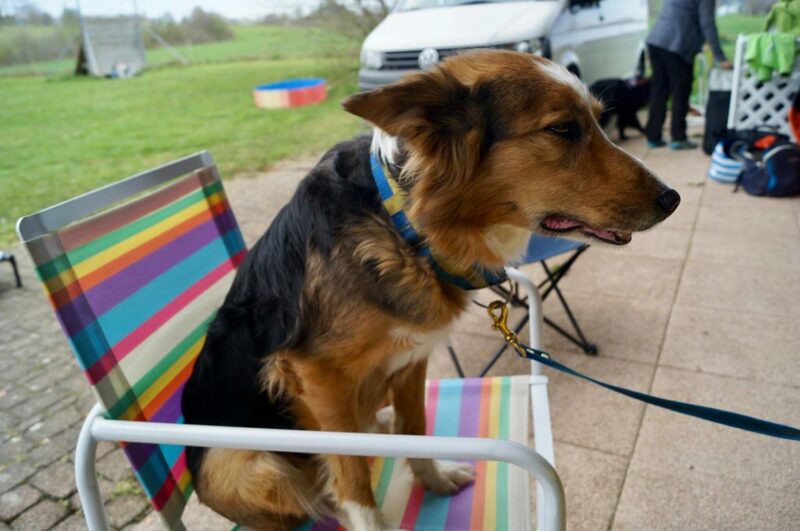 When we decided to pick up a new car in Gothenburg, it felt like a good idea to drive a couple of hours further south from there to do 3 x A3 with 3 dogs. Nine runs in five hours! And it went really well. Epic won his first run. 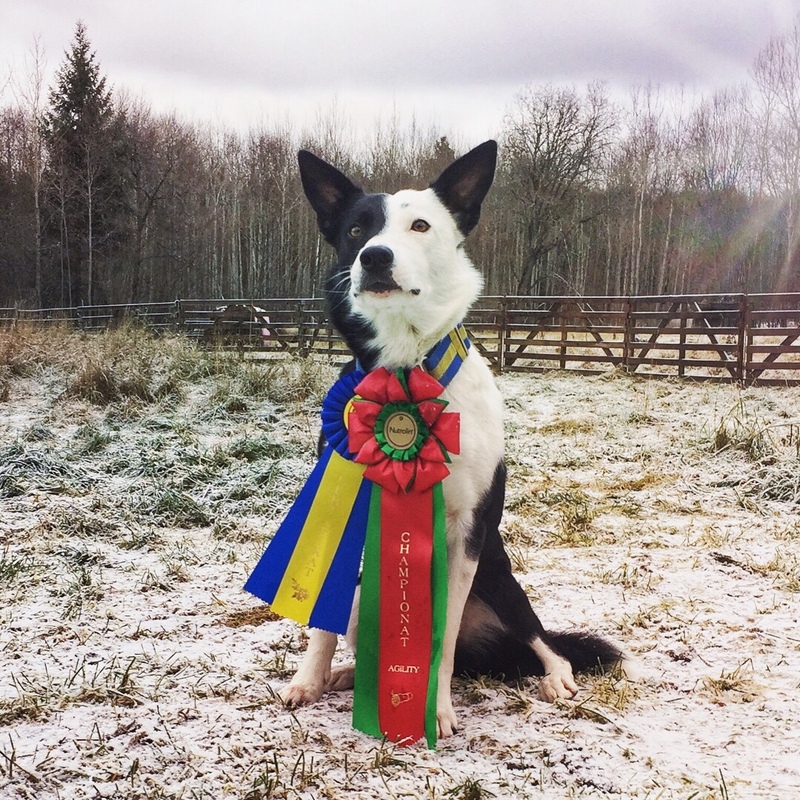 Bud won his second and became Swedish Agility Trial Champion. Squid ran two clean runs and placed fourth in both. Squid did one weekend of competition in January, but we didn’t get the result we were after even though she felt great. After that she had nine months off from agility. First, she had puppies. Then I probably let her run too much too early in the forest, and she showed some lameness and didn’t move well. It took some time to get an appointment with our physiotherapist, but we were back on track after two treatments in August and September. She hadn’t lost a lot of muscle as she was able to swim and walk on leash in the forest all summer, but I was nervous to start jumping and agility training again. It went well, and agility seems to only do her well. We entered our first competition in the beginning of November, and my dream goal for this year was to place top 5 once so that she would be eligible for Swedish Team Tryouts in May if she’s still fit then. The first run was a bit weird with a few bars and miscommunication. The following two runs felt great and she ran both clean. Her times were not as good as I’m used to, and we were only fast enough to earn a leg for nationals in the last one. 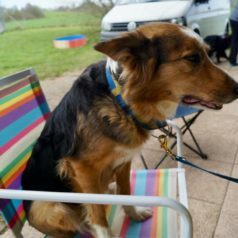 I had entered all dogs in a much bigger weekend trial two weeks later, but I had some trouble leaving the farm with Thomas working away that week. I went on Sunday afternoon and Squid had one standard run. I did not expect her to place since the classes were big, but she actually place fourth and our goal for the year was met! We did three runs the weekend after and Squid ran clean and won two of them. I had some handling errors in the first two runs in our next trial, but we ran the last one clean and placed fifth. And then this Saturday we had two clean runs with fourth place and one elimination. We’ve had 13 runs since she came back in November. Eight were clean, seven of them with a leg for Swedish Nationals (we need another jumping leg to be qualified for next years National Championships) and six top 5 placements (my dream was to get one). Results are great considering we haven’t really trained agility (right now we’re focused on conditioning and jumping skills only, the rest seems to just work), but the most important thing is that Squid is back in business! I was so afraid that the lameness that came after her puppies would be the end of our agility career. Squid turned nine this September and every run with her is a gift! She’s so happy when she gets to come along to training and trials, and when I take her out of the car and she knows it’s her turn. I’m so incredibly happy to have the privilege to compete with her and feel that she does her very best at all times. All faults are mine. Squid would have had many more clean runs if I’d done my job as well as she does hers. We’re now focusing on strength and conditioning to come back even stronger and faster during next year. I’m sure that we’ve got more to do and Squid does not in any way think that she’s old. Epic has also had a great season. We’re a good team and our runs are often very smooth. Our problem has always been dropped bars, but I think we’ve improved this year and had more runs where all bars stay up than we’ve had before. 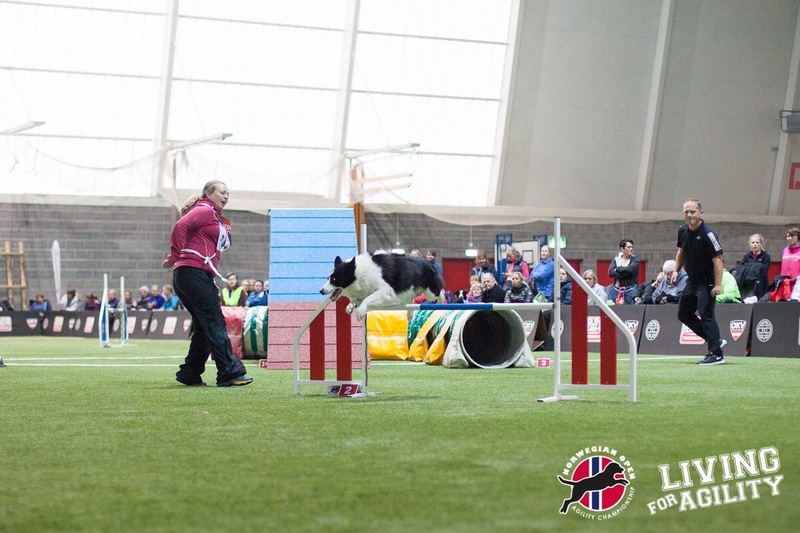 We’ve collected eight legs for Swedish Nationals and need one more in standard agility to be qualified. We also finally earned our final agility certificate, making Epic champion of both jumping and agility. We’ve actually had even more success in bigger competitions than the normal ones. I did not have any big expectations on National Team Tryouts in May, but I worked hard in preparation for it. The feeling was amazing! We’ve never had such a good weekend of trialling and those bars stayed up until the very last run. We ran clean and fast enough to earn a spot in the Swedish team for European Open and the Nordic Championships. We made team finals at European Open and we ran our part of the final course clean! We had a great time at the Nordic Championships. We had a bar in every run, but no other faults and we placed fairly well in total. Norwegian Open in October was another great competition for us with a lot of clean runs and a ticket to the final where we also ran clean! Epic (and I) seem to run best indoors on difficult, fast courses with big distances. Bud did his first trial about a year ago and quickly progressed to class 2 in jumping. We started 2017 with a small injury and had to get some treatment and gradual build up before competing again. 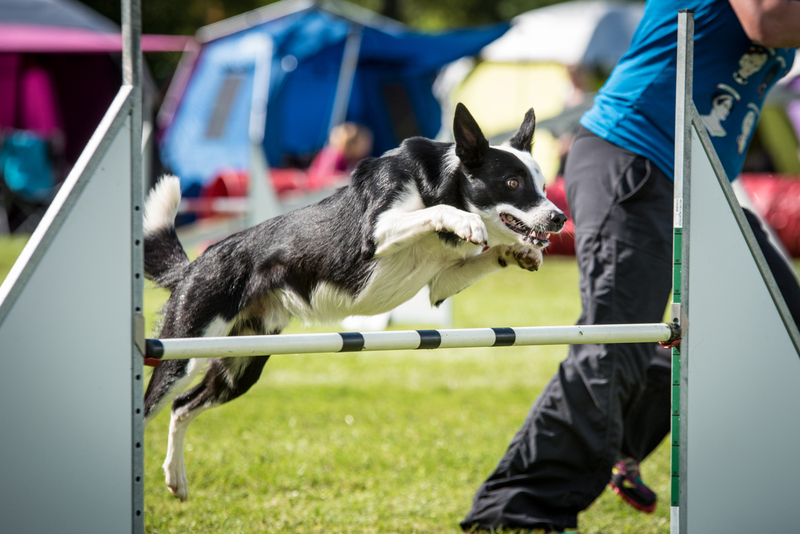 We started in standard agility in May and he earned his first leg with a clean run and a win. 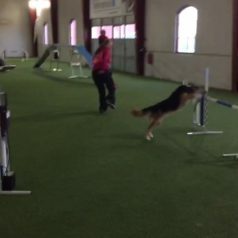 He quickly progressed to class 3 in both jumping and agility, even though that last leg in A2 took a few tries. We’ve had some more luck in standard agility once we got to class 3. We’ve only run one J3 clean (and won it with a certificate), while we’ve ran three A3 clean and earned the Agility Trial Championship title this Saturday. Bud does a lot of great things, but there’s often something that goes wrong in a run. If we have a great flow on course he often drops one bar, which he doesn’t often do otherwise. Bud is somewhat a different type of dog than Squid and Epic. He is very well trained and knows a lot, but he does get easily frustrated and doesn’t cope well when something goes wrong. It might just be a little hiccup in our communication that gets him frustrated. He forces me to become a better handler – I need to run fast and trust him while still maintaining communication and clarity. Bud is still very young (turning three this Christmas) and I think our communication will grow a lot during the coming year. I’m very happy with my decision to have Bud run the large category in Sweden. This is the first year where we have five jump heights, and dogs from 43 to 49.99 centimeter can chose to compete in large and jump 40-50 cm jumps, or to compete in extra large (where Squid and Epic compete as they are about 53 cm tall) with 50-60 cm jumps. I like that I can take it easy with preparing him for 60 cm (which he has to jump internationally) and I haven’t seen any fallout from competing on lower jumps. I even like that I have to run faster to keep up with him. We now usually train on the same height as Epic (55-60). Another benefit is that I don’t have to run all my dogs in the same class since some trials are small with maybe 30 dogs or less in XL. My only wish now is that I get to continue to train and compete with three sound dogs during 2018! It’s so important to really appreciate and enjoy every training session and every run with them. My thoughts are constantly with friends who lost their dogs too early, and with those that have to end their dog’s careers early because of injuries. I promise to not take anything for granted, to tell my dogs that I love them (which actually was what I did on the start line before the run with Bud above) and to take care of them in the best way possible.